Custom pinstriping is a speciality service I have been offering since 1986. I do hand painted striping on cars, motorcycles, guitars any anything else I can get my hands on. Here is a BMW I striped to ornament the BMW hood emblem. I used a two-tone color harmony that blends nicely with the color of the vehicle and color scheme of the emblem. The gray in the stipe blends with the white of the hood and emblem. The red stands as a strong contrasting color to the blue in the emblem. This is a simple, single toned design I did on a Volkswagen. The tight, symmetrical patterning is indicative of the “old-school” pinstriping style, popularized in the 1970’s but still appreciated today. This a design I completed recently on a surfboard. This went with a 3 toned color scheme, something that would go well with the natural color of the board with its inner stripe. Out came something aerodynamic, with the overall flow of the design flowing with the contour of the board itself. Additionally, the entire design, from a certain perspective, looks like a fish – appropriate given the medium. Here we have another simple yet effective design. The two colors we chose for this stripe really pop against the white of the vehicle. 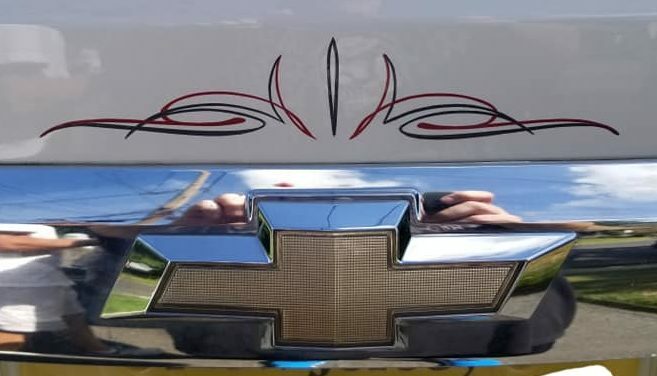 Balance here is apparent, as we see that the Chevy emblem serves as the center point for the design. This design has an unmistakable retro vibe to it. We chose a neon light orange to sit atop the unique green of the vehicle. The black is subtle but adds a nice layer of depth to the design. Again notice the symmetry and patterning of the old school striping style. If you are interested in having me custom stripe your vehicle, feel free to give me a call. I do my work out of my home in Farmingdale, NJ. If you are not in my general area, I also offer my services on a mail-away basis – you can mail me your components and, after work is complete, will mail them back to you. Please allow patience as faster or slower turnaround is based on my project que. Thank you for your understanding.